Snow comes and goes in the promiscuous Pentlands. The hills can be clad in white one day, only to be stripped under the cover of darkness. On Friday, 24 hours before the annual Carnethy 5 hill race, the Pentlands were brazenly green and brown; by Saturday morning, modesty had intervened: they were clothed like a virginal bride. To this white world we went, dumped by coaches in a field next to the A702. We trudged in a sullen line to the start, pathetically trying to avoid premature wet feet by hurdling the saturated ground. 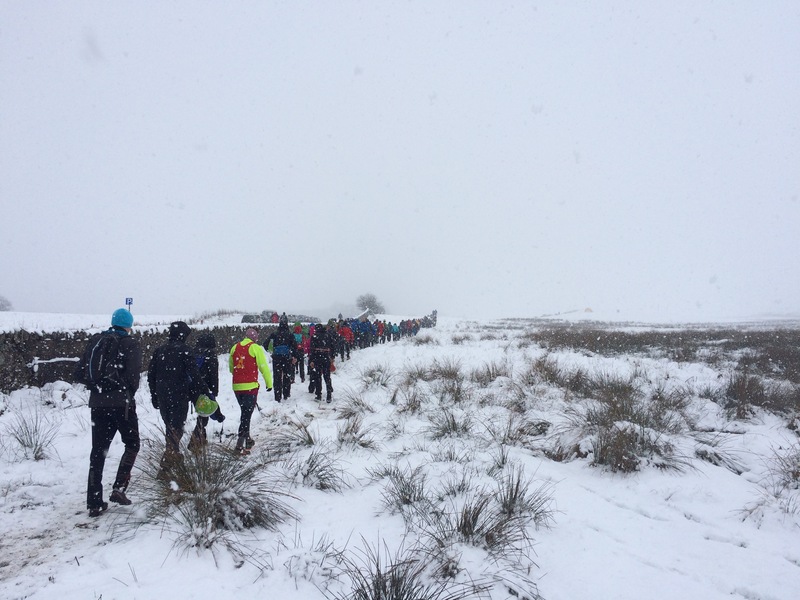 We arrived to the apocalypse: amid a sodden, snowy wasteland stood a cluster of tents containing half-starved shivering people, clasping hot liquid and looking across to a hazy white chaos encasing the hills, all wondering the same thing: what the hell are we doing here? I had listened to a podcast that morning describing the merits of mindfulness. 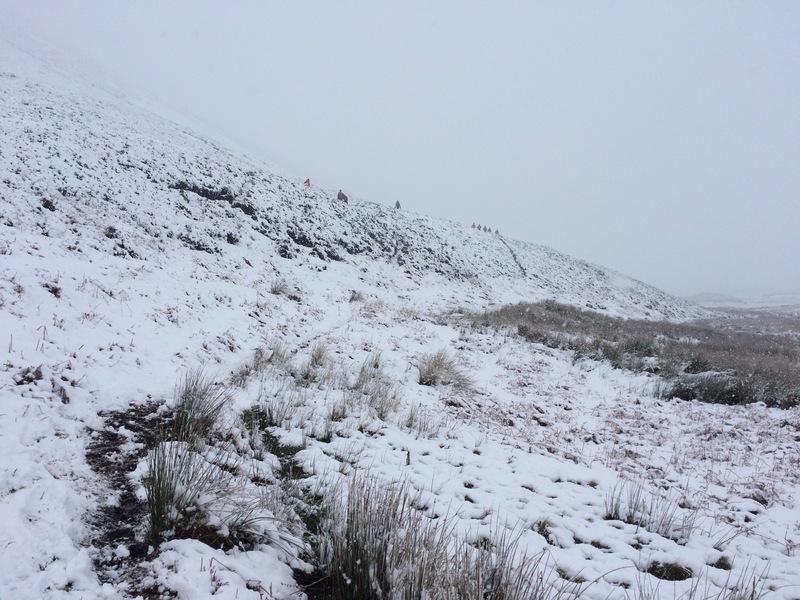 As I clambered up a slope of ice to Scald Law, grimacing against the wind whipping snow in my face like an annoying child flicking your ear, I mused on the concept. Mindfulness – I looked it up to confirm – is ‘a mental state achieved by focusing one’s awareness on the present moment, while calmly acknowledging feelings, thoughts, and bodily sensations.’ And so I calmly acknowledged the list. Feelings? Apathy, resignation, frustration bordering on fury. Thoughts? What the hell am I doing here? Could this actually be the apocalypse? Bodily sensations? Lactic, nausea, cold, general discomfort. I eventually found my way to the summit. I’ve been here before. Not that I recognised anything in the white furore. It could have been the Moon. The wind was blowing hard. I ran the same way as everyone else, downhill, and obliged my competitors by being repeatedly overtaken. South Black Hill is found on a spur off the main ridge, but it is deemed so important, racers in the Carnethy 5 and Pentland Skyline must pay homage to it. There is then a lovely path that traverses to a col – it’s called Cross Sward; Wallace may or may not have done something terribly brave here – beneath East Kip. Lovely, that is, on a fine, dry, sunny summer’s day; today the track was an evil camber that flipped the unsuspecting overboard. Runners went down like drunks. I was sick of snow. The next time it snows, I’m going to shrug at it too. On West Kip, the poor marshals were huddling beneath the ridge trying to escape the ferocity of the wind. I know exactly what they were thinking: what the hell are we doing here? The route spilled downhill again, dropping some 250 vertical metres to a landmark called The Howe. I actually tried a bit here. As gravity did its thing, I was tricked into thinking everything was going to be okay. I won’t let anyone overtake me, I decided, and I will count the number of people I pass. I was moving well, having counted to seven, before a tumble took me back into the red. Be mindful. Focus on the moment, the glorious, precious moment. Easier thought than practised when slogging up a snow-filled gully – with a Lochaber rear end inches from your face – to the invisible summit of Carnethy. I was midway up the gully – the Lochaber backside replaced by an HBT one – when I looked at my watch. I had run 4.3 miles in 47 minutes. Gavin Bland, in breaking the course record in 1999, would have been back in the apocalypse field. I still had to get to the top of this dreadful gully, shuffle up and over Carnethy, flounder down a zigzagging slope of snow-immersed scree and heather, and cross the battlefield to reach my own apocalypse. It was a humbling thought. I was humbled too when I saw the results. I was 91st, one second behind a man in his 60s. 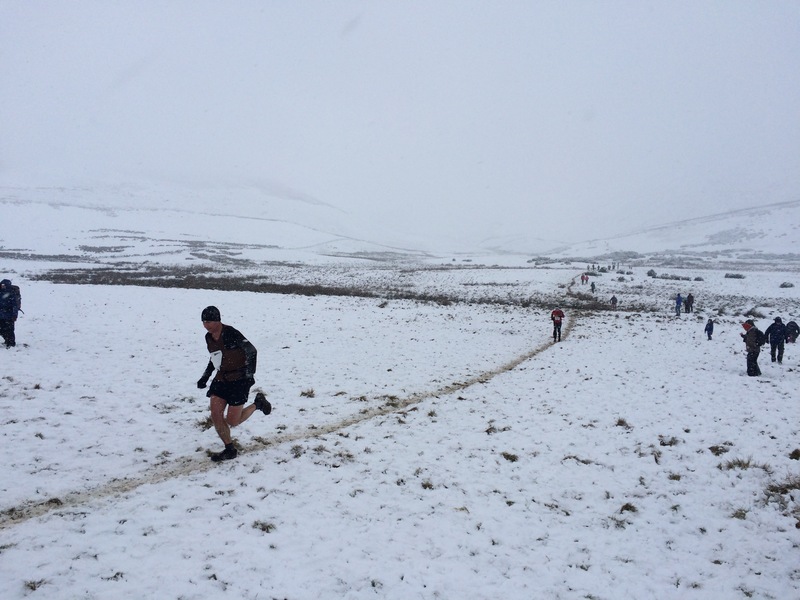 But that, I suppose, is the essence of this sport of hill running: to be humbled by the elements, by the landscape, by our own insufficiencies. And I was just another in a long line of Englishman to be humbled in the hills, glens and fields of the Pentlands. Next Post Hill running: the ultimate sporting juxtaposition?